Inventor Fusion import and editing functionality was removed from AutoCAD 2014 and in the meantime there has been a beta program of Autodesk Fusion 360. A couple of days ago Autodesk Fusion 360 was released. It is free for the next 90 days, and upon expiration of the 90-day initial offer will be available for purchase from the Autodesk e-store for $25 per month, per user, based on annual contract commitment. Special pricing is available for students and entrepreneurs. 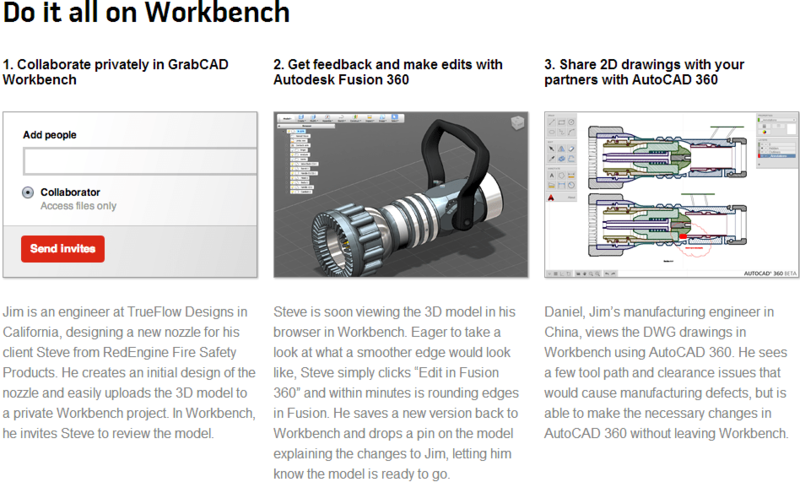 Today it was announced that Autodesk Fusion 360 and AutoCAD 360 will be available on GrabCAD Workbench. “Autodesk and GrabCAD have teamed together to bring you the power of Autodesk Fusion 360 and AutoCAD 360 with the convenience of GrabCAD Community and Workbench.” AutoCAD 360 is already there and Autodesk Fusion 360 is coming soon. Fixed an issue with the Get Feature Descriptions in JTB FlexReport Config where it just did not work to get the descriptions. Note that it is only JTB FlexReport Core that is updated to 7.4.2. Uninstall existing JTB FlexReport Core and install the new one. Here are the downloads and upgrade tips. If you use SQL Server there is no need to upgrade between 7.4.1 and 7.4.2. Have you problem with DWG files that have become bloated while copying and pasting from DWGs containing DGN linetypes of MicroStation origin or after using DGNIMPORT? AutoCAD DGN Clean-up Tool can be downloaded here and help you out. UPDATE: The download is not available as Autodesk is working on a bug fix. This Hotfix applies to AutoCAD 2013, Autodesk AutoCAD 2014, and related vertical products. installation folder (for example C:\Program Files\Autodesk\AutoCAD 2013). 3. Open the affected drawing file. 4. Run the DGNPURGE command to make the elements purge-able. 6. Repeat steps 4-5 if needed. 8. Repeat steps 3-7 for other affected files. Purged 18 unreferenced complex linetype records (of 20). Purged 155 unreferenced strokes (of 157). But the current version of DGNPURGE seems to be affecting lines that are using DGN linetypes too in some cases. Compare with the image above. Autodesk is now aware of that compound linetypes are not handled properly and is working on an update of the tool. If you want to purge many drawings our SmartPurger can be used to automate the work. Here is an example of what the AutoLISP code would look like. Note that even though SmartPurger runs a purge the LSP is loaded after so we need to run purge through the LSP instead. If you like you can change the number of times this is repeated. Right now it is 3 times. Edit the path as needed and remember to use \\ instead of \. For technical details around purging traces from DGN linestyles see this post on Through the Interface. Complex DGN linestyles – that presumably cannot be mapped directly to standard AutoCAD linetypes – have entries in their Extension Dictionaries named “DGNLSDEF”. These objects contain references to objects in the “ACAD_DGNLINESTYLECOMP” dictionary (which is inside the root Named Objects Dictionary). The objects in this dictionary represent the “strokes” in the linetype. They might be simple (in the case of STROKE1, above) or more complex. Complex strokes can refer to each other and also to anonymous blocks in the Block Table. UPDATE: Details about the issues found in the first release and source code for the fix. JTB FlexReport license and application usage monitoring tool has got some bugs squashed in version 7.4.1. No new features are added. You may see it as a service pack 1 for version 7.4. See the revision history for what’s been fixed. Here are the downloads and upgrade tips. Are you using AutoCAD 2013 verticals? If so, here are some Service Packs you might want to install. Windows 8 operating systems are officially supported for these products with SP2. In this post AutoCAD 2013 Service Pack 2 is described and is also included in the above service packs. If you have not installed SP1 it is included in SP2. AutoCAD Architecture 2013: _VERNUM = "G.55.0.0 (UNICODE)"
AutoCAD Architecture 2013 Service Pack 1: _VERNUM = "G.114.0.0 (UNICODE)"
AutoCAD Architecture 2013 Service Pack 2: _VERNUM = "G.204.0.0 (UNICODE)"